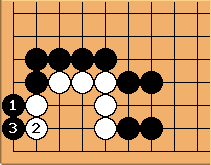 In October 2013, Go Game Guru published another hard problem that I couldn't solve but when I looked at the solution actually was a fairly easy problem. So I thought I'd discuss it, to understand why easy things look difficult, or rather, how we make things difficult while they're easy. As so often, it is because we are not faithful to the fundamentals. play at the vital point''. 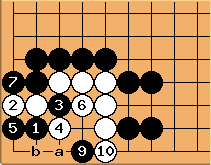 However, when trying to solve this problem, I was looking at the vital point(s) first. I couldn't cope with the ramifying variations and gave up. Here are three variations I read through in my mind. After , a and playing at are miai. at . After , a and b are miai. 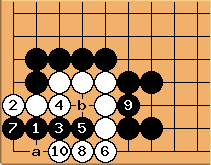 After , the eyespace has grown very large and Black will either have to create a big nakade or an eye in the belly. This variation shows the latter option. If at a creates an eye in the belly, White has enough outside liberties to atari at b. 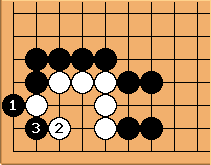 As said, reading three variations of >10 moves deep had soon exhausted me and I could not resist looking at the solution. This was my own fault (besides looking at the solution being a bad habit):playing inside the eyespace tends to invoke a response that enlarges the eyespace, so that the room for maneuvering inside increases. This makes the problem harder to read. 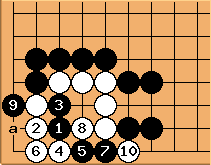 The easy move didn't occur to me because I forgot the fundamentals of life and death. The easy move, the first move one needs to consider when trying to kill a group like this, is the hane, in this case the hane on the first line?. There are two places to hane here. The best hane is the one at the weakest side of the eyespace. If White stretches, then the shape becomes a known shape: the door group. Problem solved at move 3! (ok, the corner makes the door group a bit peculiar but still easy). This gives us at least something to work with and explore variations. Reducing the eye space once more allows on the vital point and White is clearly alive. This hints that after - , it's about the vital point (or perhaps the cuts first?) and reducing the eye space is not key anymore. 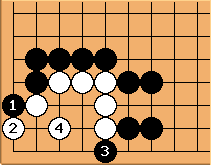 Incidentally, had White played the vital point at , then is an easy kill. This is almost a no-brainer but you can see how rapidly a problem is pruned when reducing its complexity.